Here we are, five months after the first release of Rational Quality Manager and Rational Test Lab Manager. We have received great feedback from our early adopters and customers, but we want more. We want to hear from you and what better way to do it than to open the flood gates and let everyone in. Thus, we are taking the plunge — opening up RQM and RTLM at Jazz.net! We’re giving you the ability to get access to early releases, to understand our plans, and to provide input. We will start by utilizing Jazz.net for RQM 2.0. We heard you loud and clear and now you can interact directly with us about bugs, enhancement requests, and general feedback. 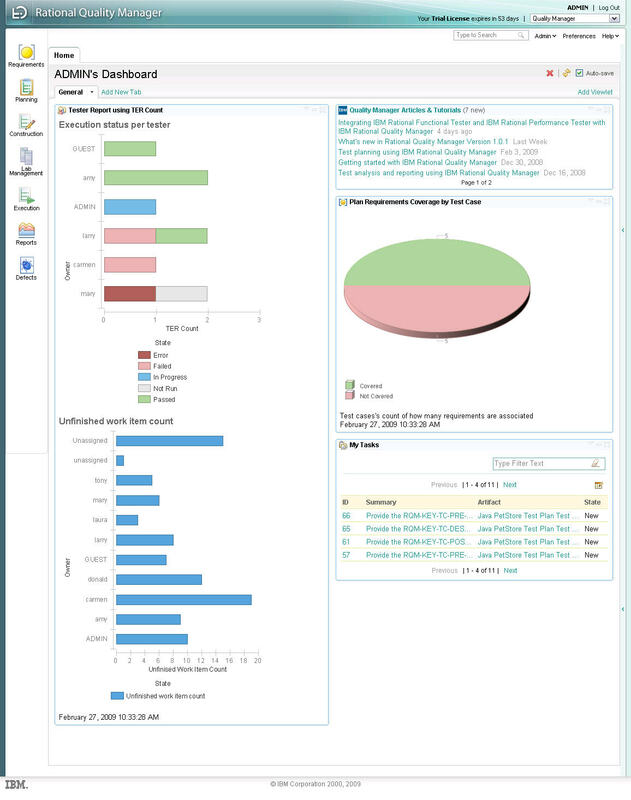 At the same time, we’ve also made a trial of our current release, Rational Quality Manager and Rational Test Lab Manager 1.0.1, available for download on Jazz.net. Be sure to check back in a few of weeks when some adapters to interface Rational Quality Manager with HP Quick Test Professional and HP LoadRunner will be made available for download. We’re in the process of migrating our Rational Team Concert repository to Jazz.net, but we wanted to get this much going ASAP to start getting community involvement. So let’s get this party started. What can Rational Quality Manager and Rational Test Lab Manager do for me? Very simply: bring world peace. OK, maybe not. But it can bring project peace in terms of improving quality. 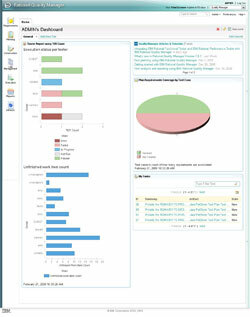 IBM Rational Quality Manager is a web-based, centralized test management environment. As we leverage the Jazz Foundation, collaboration is a key aspect of Rational Quality Manager. Now, Quality professionals can ensure their test plans and test objectives are aligned with business objectives. Instead of the monolithic 60 page test plan that is created before any work is done in the hope that the objectives defined in the plan are met, we can capture the right information, at the right time, keeping the quality objectives and business objectives aligned. How do you know when you are done testing? Tracking yourselves against your objectives will provide the insight needed to answer that question more easily. What will we see in 2.0? How will you help me create the test plan, so I don’t have to type everything? When will you incorporate risk-based testing? Can you provide me metrics to help me establish the ROI of my test Projects? Do I get any guidance to help me decide when and if to automate my manual tests? Can a finished build trigger a deployment of a test environment, execute tests, and give me results telling me if this build is good enough to test? Your feedback has driven the major themes of this release, which you can see in the release plan. We hope that you’re as excited as we are about our more transparent approach on Jazz.net! Great to see RQM on the site! Looking forward to all the open collaboration around RQM. Congrats, Brian! The Jazz platform is the backbone for RQM and RTLM. Leveraging Jazz.net takes us to the next level of collaboration with our users. Congratulations to the RQM team on this big step – both the releases and getting onto Jazz.net! Congratulations, Brian and team! Great to see you take advantage of jazz.net and make your products available to the wider community for feedback and collaboration. Well done RQM team. It is great to see RQM on jazz.net and I will watch the forums with interest. Awesome, everything is looking great! Congrats to the team for pulling everything together, too!